The Obama campaign, in an effort to shore up support in the LGBT community after inviting recloseted, antigay, Grammy-winning gospel singer McClurkin, seems to be completely off the P.R. rails today. The "Embrace the Change" concerts in South Carolina this weekend are supposed to woo a slice of the religious black vote. 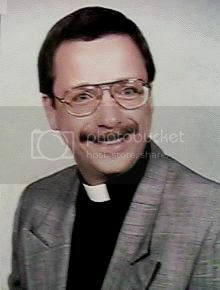 The camp recruited the Rev. Andy Sidden, pastor of Garden of Grace United Church of Christ in Columbia, S.C., an openly gay minister, to deliver a message of tolerance to the black audiences at the concerts, there to see a few luminaries of the gospel world. The problem is that Sidden is white. Not that there's anything wrong with that in the abstract. (In fact, when I saw his picture I actually thought he was a light-skinned black man; I've got family members lighter than he is, so I never gave it a second thought.) I'm convinced that Sidden will share a message that is sensitive and entirely appropriate, but given this situation, it's mind-boggling that the campaign would select a white pastor to address homophobia in the religious black community. We're talking Politics 101. Mike commented over at his blog today. He's a nice guy and was gracious and happy to come on my show yesterday -- at least, that was in the morning, when my producer, David Guggenheim, booked him. Later on, he was reticent, almost canceled, clearly getting pressure from the Obama campaign not to do it (he mentioned a name of someone at the campaign -- Joshua -- and this was shortly after someone called us to cancel for him, but we could not, bizarrely, identify who that was; the Obama campaign later wrote my producer to say that no one at the campaign had called to cancel for him, but the call came on our guest hotline, which general listeners do not have). The question is, why were they trying to stop him from coming on? One of the reasons might have to do with this: On the show he did not deny African-American lesbian blogger Jasmyne Cannick's description of him as white. I must say that this was baffling. I did not even think for a minute that the Obama campaign would choose a white minister to bring the message of acceptance of homosexuality to a black audience at a gospel concert featuring a hugely popular antigay black gospel singer. I assumed from his photo that the Rev. Sidden was black and light-skinned, or biracial. Sidden also told me he was not an Obama supporter, and accepted the invitation because he'd never turn away someone who asked him to pray. The last thing a crowd of black folks who have a problem with homosexuality needs is: 1) to be "told" by the Obama campaign that a message about tolerance must be delivered from a white voice of faith, and 2) to have their beliefs confirmed that being gay is "a white man's perversion." Coming from a white pastor under these circumstances, can only be seen as paternalistic and patronizing; the shields of defensiveness will go up, the message will be ignored. That's the reality, and it's one that pains me because we should be able to discuss race matters across the board. I try to foster a safe space on my blog for people of all colors to weigh in on these third-rail topics, and even so, if I post on a race-related issue, commenting is inevitably lighter because our society has made it difficult to have these conversations without a good number of blacks feeling patronized and progressive whites afraid that they are going to be flamed for daring to offer an opinion. This is the state of things, and it isn't pretty or productive, so we're dealing with the world as it is, not as we'd like it to be. The stinging message that the Obama campaign has sent is that they apparently didn't see the relevance or necessity of removing the ability of religious blacks to stay in denial, that somehow there is not an intersection of being black and gay. This move renders us invisible yet again, as politically expendable, because it telegraphs that it's too politically volatile to address the division in the community by having them confront one of their own -- black gay and gay-affirming ministers -- when it comes to looking at bigotry. I have been following the reaction in the black gay community, and many but not all of the commenters are outraged by the decision. It was bad enough that McClurkin was invited in the first place, but it only adds insult to injury to ignore the longstanding concerns of the black gay community by not talking to people in the black gay community themselves. And if someone had to be invited, why not invite someone in the black gay community? Or why not invite a black mother of a gay or lesbian child? Or a local black pastor who supports the full inclusion of gays and lesbians? ... Barack Obama is a good guy who supports the gay and lesbian community. I think his campaign did not serve him well by putting him into this very difficult situation. But now he's got to figure out what to do. This will all be over in a week, but in the meantime he's provided a convenient excuse for the Obama-haters to attack him. 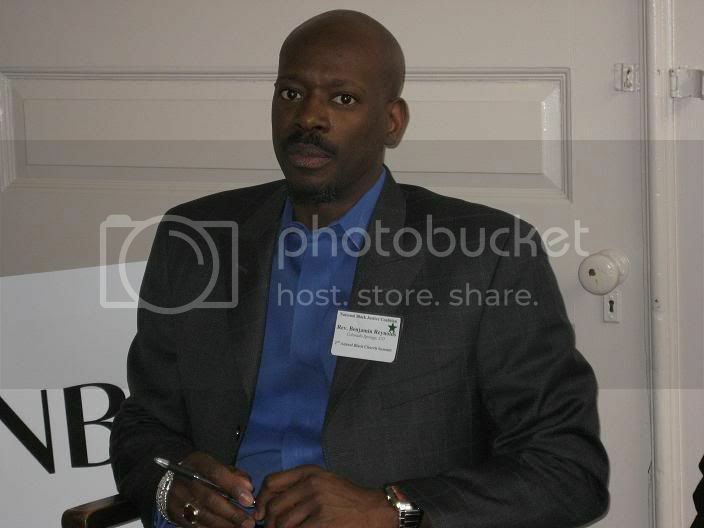 The truth is that McClurkin can bring in the element of the Democratic party that openly despise and actively support legalizing discrimination against the community Rev. Sidden's addition to the program is supposed to mollify. What's unsaid here is that the LGBT community, and our families, are less important to Obama and -- let's just say it -- to the Democrats than the constituency that McClurkin's participation represents and is intended to attract. We are as much an afterthought as the belated addition of Rev. Sidden to the tour. And the message is that we'd best accept our position in the back of the bus for now, until everyone and everything else is taken care of. Then maybe, just maybe, we will have earned a spot closer to the front of the bus. This is either a case of not knowing what would happen when McClurkin's participation inevitably became known, or just not caring, because his participation would almost certainly pull in African American voters whose selective reading of scripture means anti-gay bigotry is a big draw and an even bigger uniting factor. What's clear is that Obama, and I think the Democrats in general, want to have it both ways, and to somehow bring the Donnie McClurkins of the world and the LGBT community to the same table. But that can't happen without someone getting a better seat, closer to the head of the table, along with the access and influence that come with it. If the LGBT community accepts this from Obama, the Democrats, or progressives we risk becoming something akin to "Log Cabin Democrats," along with all that status implies. If we allow them to have it both ways. My issue is that there are notable and respected gay and gay-affirming black ministers who could have been tapped; was the Obama campaign not able to type Google.com in its browsers? Left to right: Rev. 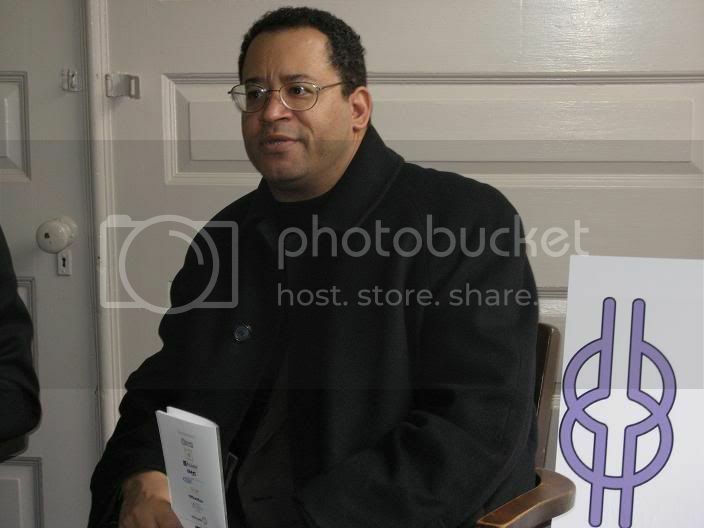 Michael Eric Dyson, Rev. Benjamin Reynolds, Rev. Zach Jones and Rev. Dyan McRay. Or what about Rev. Deborah Johnson? 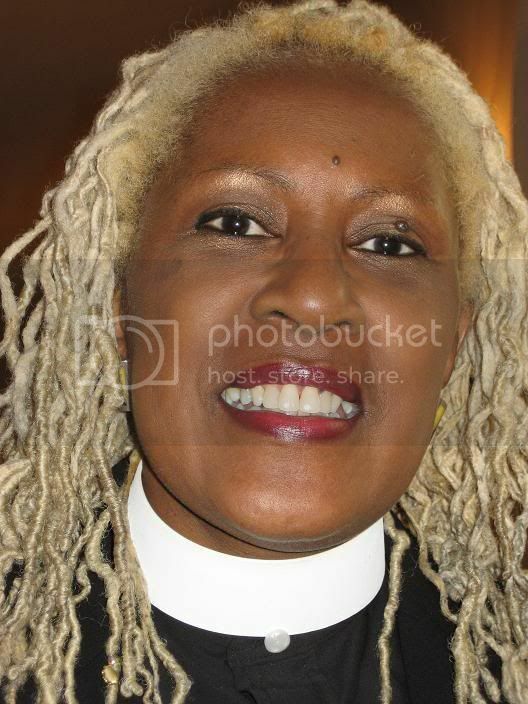 Bishop Yvette Flunder? Rev. Irene Monroe? I mused last night that perhaps no gay or gay-affirming black pastors were willing to extract Obama from this mess; who knows? To top nightmare matters off, on Thursday journalist Clay Cane published an exclusive interview: "'Ex-gay' McClurkin's alleged lover: I was with him after he prayed away the gay." So much for "recloseted." Over at my place, Unclaimed Territory commenter Ktwdawg surfed over to ask my views on church-state separation, based on the views I've expressed here. Hey Pam, this is the self-same Ktwdawg from Salon. I was wondering what your take on the separation of Church and State is -- obviously pertaining to candidates for high political office. You seem to want Obama to speak to the black christian community about their homophobia and -- while I know he opens some room to maneuver on the C&S issue simply by organizing an event around Gospel artists deeply connected to that constituency -- I can't help but feel like you are treading a very thin line in what you're asking Obama to do. Of course, that's according to my interpretation of where the line should be drawn between a candidate engaging a specific religious constituency on political matters, and a candidate wading full-steam into a cultural battle that embroils the THREE hot-rails of contemporary politics: Race, Religion, and Equal Rights for the LGBT community. That's why I'm very interested to know [what] your interpretation of the Church/State/political candidate dynamic is; a bigger political boondoggle could not be invented by Karl Rove, etc. if he tried his damnedest. I want to say that I do fully support rights for LGBT citizens -- though I have the same reservations about federal language dealing with the term "marriage" as Obama does. 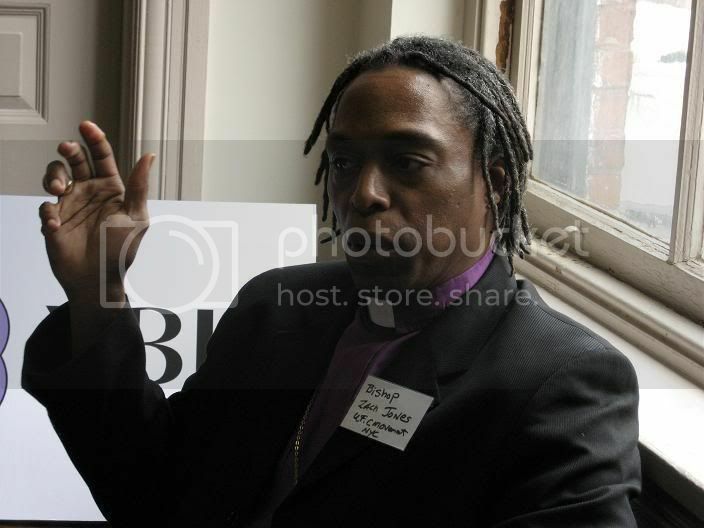 I'm a 26 year-old white male "breeder," and none of this is neither here nor there for me, however, as my concerns are mostly with the delineation of the problem of homophobia in the black community, its undeniable roots in the black Church, and what the appropriate strategies for change are -- especially concerning the involvement of a political candidate in a deeply religious issue. The real rock-and-hard place that Obama finds himself between is the expectations of a progressive black leader in the middle of a heated contest for the Presidential nomination, that demands special attention to his "own" demographic (since, I think, he has been found "black enough"), all of which includes the issue of LGBT rights and the tightly bound problems within the (black) Church. I think we can both agree that the best thing would have been for Obama not to have put him in this situation, but now that he's here -- do you think it is fair to him, and appropriate within your understanding of the lines between C&S, to be attacked unilaterally, without pluralistic caveat -- especially considering his record on LGBT issues? My response was that of course I believe in church-state separation. Unfortunately the right (and some on the left, albeit with less malice) tries to have it both ways. And as far as the right goes, it has chosen to cross the line by trying to deny civil rights to LGBTs, citing religious reasons as a basis for doing so. The problem with the top-tier Democratic candidates is that they have voluntarily sought the religious vote by citing their religious beliefs as a reason to deny civil marriage for gays and lesbians. Not only that, the Democratic Party has spent a lot of time, energy and money trying to find out how to court the religious (specifically evangelical) vote. Religion holds no place in the campaign, or in government, other than to support the right of people to practice and exercise it. Obama has been a friend to the LGBT community (other than his lack of support for civil marriage for gays and lesbians). That doesn't let him off the hook for being surrounded by complete ineptitude on this issue with McClurkin. I'm only pointing out that once he opened the Pandora's box of personal religious convictions, Obama -- or any candidate -- cannot then step back and pretend he holds no responsibility for crossing that line when the going gets tough. Mitt Romney certainly vacillates in the same way regarding his Mormonism. I really don't understand the followers of faith-healing televangelists. These clowns of the cloth enthusiastically use scams to separate cash from the wallets of the faithful. You know, the folks ready to give their last dime to prosperity gospel pastors in the pulpit. [It] is the belief that God wants Christians to be financially rich. It is promoted by many conservative evangelists, especially televangelists. This gospel appeals to people from various incomes. It confirms to the wealthy that their wealth is proof God loves them, and that it's OK to pursue wealth, even to make it top priority. It appeals to the poor because it seems like a way out of poverty. What better message absolves yourself of guilt as you step over the homeless person when you walk down the street in your new threads.